It is hard to rate this properly because it is a nice hotel. The front desk staff was excellent. There is parking available in a garage underground which was invaluable and inexpensive. The room was clean and had a great TV; the bed was comfortable. The bathroom had a great little mirror for make up. I think it would be a better place to stay in cooler weather. It was a bit of a hike into the main area of Reims but not killer; it is located in a residential area with no cafes nearby. But it is about a 10-15 min walk the mall area around the fountain which has loads of cafes and shops. Very close to city center, but this is not the only hotel there. There are at least four close to each other. Good breakfast. Easy to reach. Good parking. 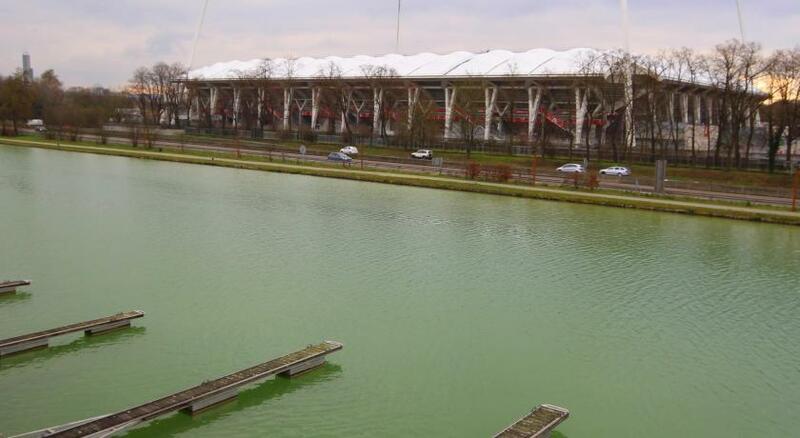 The area is ok, near the cathedral and along the canal. Excellent location for accessing the hotel from the motorway and for getting into town. The hotel reception area is very impressive and the staff are friendly and helpful. 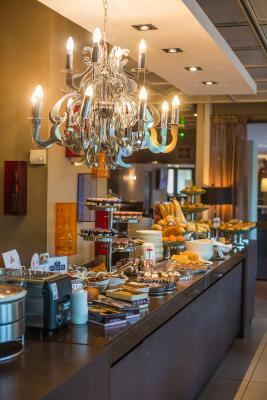 The restaurant is above average.There is a good choiceof Champagne but the wine list is very limited (a choice of two white wines in France,) The food is good but the choice is limited. 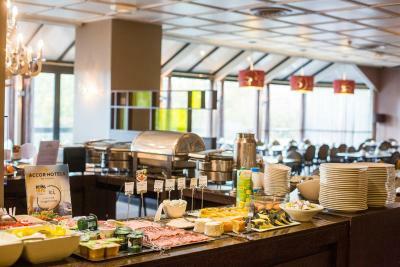 Location fine - good spread - no problems finding a table and chairs. Newspaper available in English. Coffee dreadful even though it was from a machine. Great that the service starts at 6am. 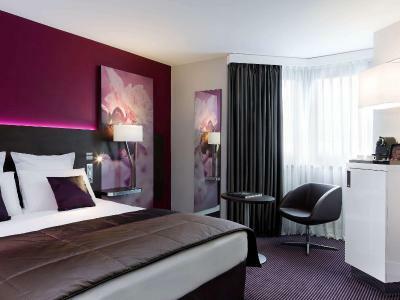 Mercure Reims Center Cathédrale is located in the center of Reims, a 3-minute drive from the A4 motorway and a 8-minute walk from Reims Champagne Congrès. Noter-Dame de Reims Cathedral is 2,800 feet from the property. The air conditioned rooms features free WiFi, a flat-screen TV and a private bathroom with free toiletries and a hairdryer. 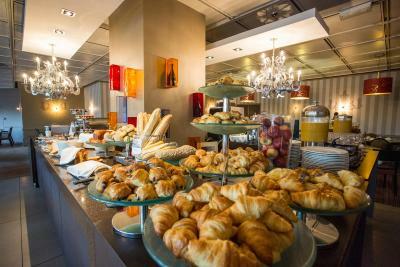 A continental breakfast is served daily, The restaurant, serves traditional French cuisine and Le Duke snack bar offers a large choice of champagnes. 12 meeting and conference rooms are available on site, while a fitness center and an outdoor tennis court can be found nearby. Mercure Reims Center Cathédrale also has a private car park on site. 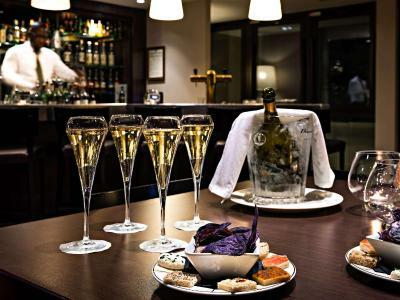 Champagne houses can be found in Reims and vineyards can be reached easily. Mercure Reims Center Cathédrale is 0.9 mi from Reims TGV Train Station. 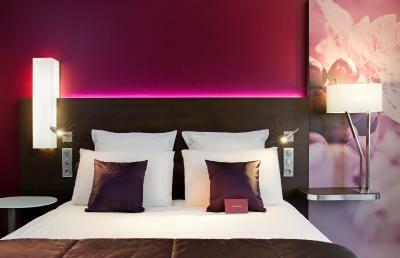 When would you like to stay at Mercure Reims Centre Cathédrale? Air-conditioned room with a flat-screen TV and free Wi-Fi access. 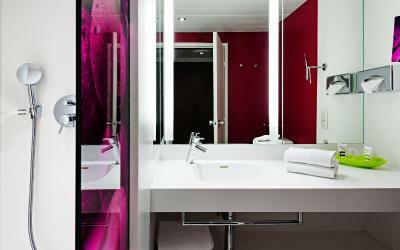 Extras include a mini-bar with free soft drinks, an espresso machine, bathrobes, slippers and toiletries. 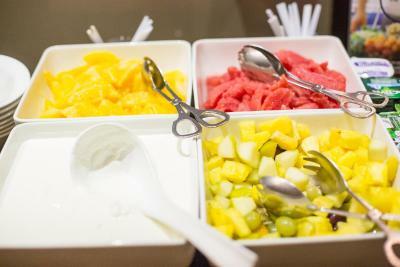 Air-conditioned room with a flat-screen TV, free Wi-Fi access and facilities for making hot drinks. The bathroom provides a hairdryer. 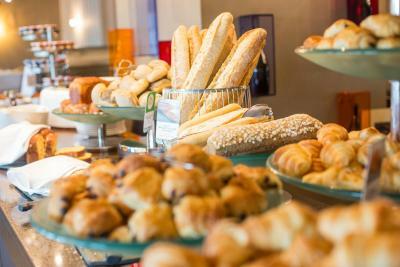 Air-conditioned room with a flat-screen TV, free Wi-Fi access and facilities for making hot drinks. A safe, a mini-refrigerator and a courtesy tray are also provided. 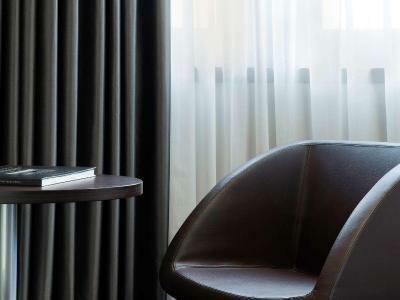 Just a stone's throw from the Cathedral, this 4-star hotel is also within easy reach of the Stade Delaune, the conference centre and the Palais du Tau. 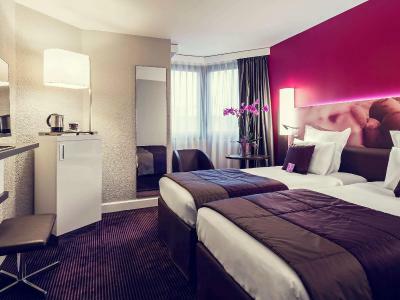 With the TGV station just 15 minutes away, this hotel is ideally-situated for business travel. 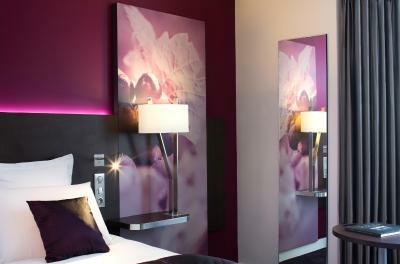 Relax and make yourself at home in our comfortable air-conditioned rooms. For a classy end to the day, slip down to enjoy the delights of our Champagne Bar. 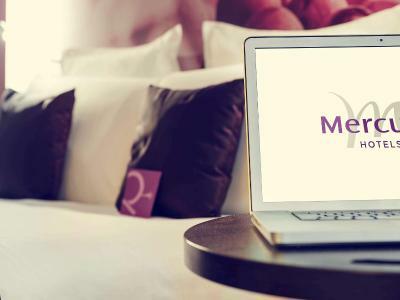 House Rules Mercure Reims Centre Cathédrale takes special requests – add in the next step! 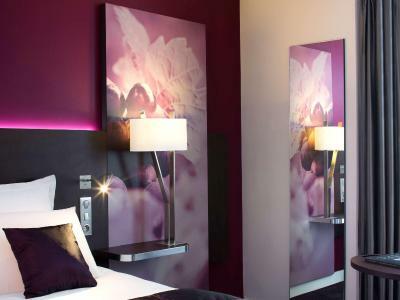 Mercure Reims Centre Cathédrale accepts these cards and reserves the right to temporarily hold an amount prior to arrival. Room very small Bathroom very small, not able to open door properly without hitting toilet. Dinner in the restaurant not good. The facilities in the room are basic( at the price of this hotel). Coffeeand tea cups are paper and water “glasses” are of a plastic which fractures if you grip the item at all hard. There is only one 500cl bottle of water provided for two people. Towels are thin and relatively small. Finally we were woken up at 4.00am with guests carousing outside our room. Not great for 150 pounds sterling, ! Coffee. Why cant the French make good coffee? The hotel (or at least our rooms) are in urgent need of refurbishment. Staff, breakfast and electric vehicle charging were all good. 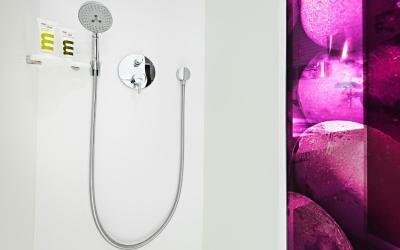 Shower room very small. Hotel too warm everywhere. Does what you expect of a hotel of this type.